In the U.S., the "bit" as a designation for money dates from the colonial period, when a common unit of currency was the Spanish milled dollar. As a way of making change, these dollars were cut into eight pie-slice shaped pieces which were called "bits". For this reason, the whole coin was known as a "piece of eight." "Four bits" was a half-dollar. Here's our designation - A bit is 1/8 Troy Ounce .999 Silver (an eighth of an ounce of fine silver). 4 Bit Silver is divisible four eighths of an ounce (one half Troy Ounce) Fine .999 Silver. Maybe that definition will make it into Wikipedia if you help us spread the word. Did you know? . . . In the old days some people used to cut a "piece of 8" into 10 sections so a 1/10 oz piece of silver was known as "short change." We don't shortchange you. 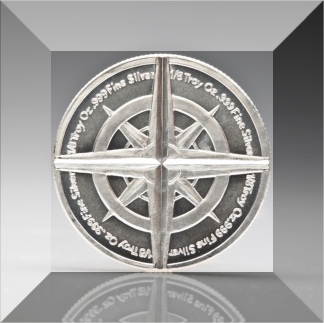 Get the world's first genuine 4 Bit Silver - the most versatile and interesting silver you could own. 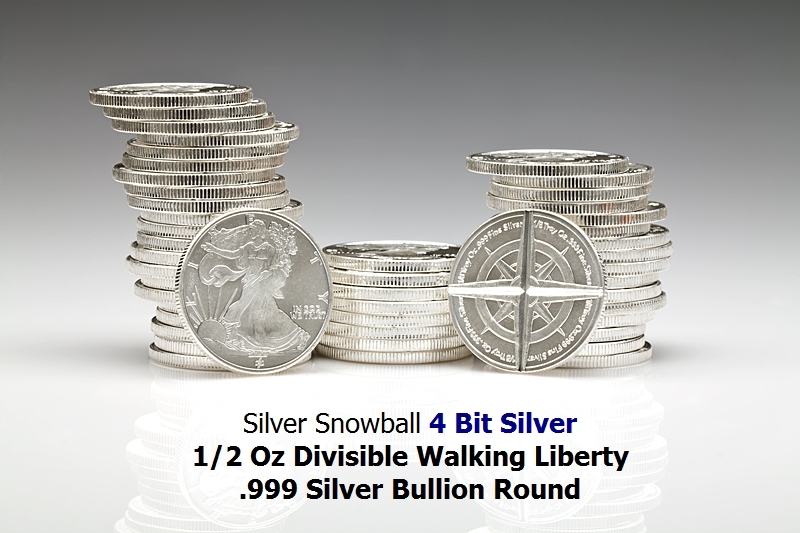 Produced in brilliant .999+ Fine Silver the Four Bit 1/2 oz Walking Liberty Silver Round is divisible into four bits, each clearly marked 1/8 Troy Oz .999 Fine Silver. 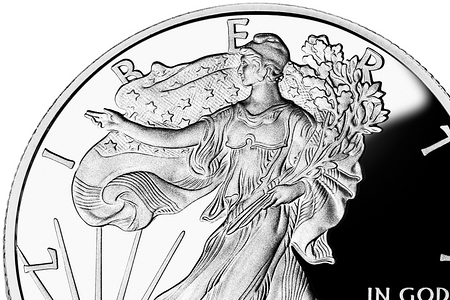 The obverse (front) of the round features Adolph A. Weinman's stunning Walking Liberty design originally used on U.S. Silver Half Dollars from 1916 through 1947. The reverse design reveals four 1/8 Troy Oz .999 Fine Silver sections which totals 1/2 Troy Ounce of Fine Silver. Frankly, we hope you never need to actually "break them to bits" as these first of their kind, "piece of 4" silver rounds are too beautiful. The idea that they could be divided into 4 one eight ounce bits is (at the moment) mainly symbolic of the time when "money" was a "store of value", like precious metals have been for thousands of years. Whether you just want something unique or understand what's going on with world and financial trends and want to be prepared, collecting 4 Bit Silver is a convenient way to own silver in a useful size. Think about it - if the worst does happen and you need to spend some silver to get something - not everything is going to cost a full ounce of silver. And because silver rounds minted in "changeable" sizes (as in "make change") almost always command a higher premium over silver content, let's hope that the financial system survives and they will just be a prized and valued collectable from the past from that time when people prepared for currency changes. We can't predict the future. We only can guess that having silver could be valuable or possibly invaluable if the current crisis deepens. 4 Bit silver is insurance in case it does. And to us, the idea of being "silverless" seems like pure gambling, like putting all your eggs in one basket - the "paper basket" of course. But perhaps the best reason to own these particular newly minted (and at the moment First Strike) shiny glossy finish fine silver rounds . . . they really get people thinking. It's fun to let people in on something new. 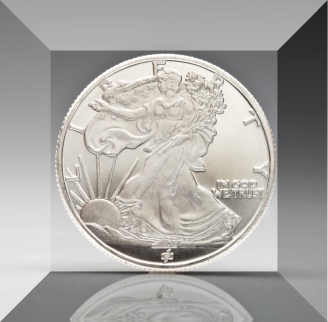 Hand your 4 Bit Silver Walking Liberty to someone and ask if they can figure out what it is. They're fascinated. When people hold these in their hands they want them. In the old days, four bits of silver would buy a couple gallons of gas or a couple loaves of bread. These days four bits of silver might be worth 1/2 a tank or buy you 5 loaves of bread. Food and gas and many many other things sure have come down in price when valued in silver. They've only gone up in price when devalued in paper money because paper money has lost so much value compared to silver. The Four Bit Walking Liberty is a wonderful silver round to collect both for the pure silver value and it's an extra bonus that they are so beautifully minted and intriguing. Start getting 4 Bit Silver today. Order your first .999 fine Silver right now.